Maybe it was plopped on your plate as a kid at dinnertime (and if your parents didn’t do a good job of preparing it, forgive them! ), or perhaps you started cooking it as an adult when you decided it was time to start eating more vegetables. In any case, this mighty green vegetable with its bristly, textured tops and woody stems deserves a lot more attention—because it’s actually really good for you. “Asparagus is a non-starchy vegetable that has a nice array of nutrients and fiber,” says Maya Feller, MS, RD, CDN of Maya Feller Nutrition. And that’s just the beginning of its benefits. Need proof? Here are some excellent benefits of asparagus that will send you out to the grocery store for an asparagus run ASAP. Check out the 7 benefits of asparagus that make it the best spring vegetable. Vitamin K isn’t a vitamin that gets a lot of attention, but the fat-soluble vitamin has some amazing health benefits. “Vitamin K is involved in preventing blood clotting and improving bone health and heart health,” says Feller. Just a cup of raw asparagus comes with 56 micrograms of vitamin K, per the USDA—over half of your recommended daily intake (90 mcg) in one fell swoop. What better way to get it than through asparagus? By now, you probably know how good probiotics are for you—they’re helpful for everything from moving your digestion along to improving your mood. But prebiotics (the non-digestible carbs that feed your gut’s bacteria) are super important, too. “Asparagus is a prebiotic,” says Feller. “[Prebiotics] help with the growth of beneficial gut bacteria.” In other words, you can’t have probiotics without prebiotics—and asparagus will get the prebiotic job done. You may have heard that folate is a super-important B-vitamin for pregnant women, but everyone needs this essential nutrient. “Folate is important for DNA synthesis,” explains Feller, adding that the body needs folate for the cells to divide. It’s also a key player in heart health and even hair growth. Adults should be getting about 400 micrograms of folate a day (during pregnancy, that goes up to 600 micrograms); one cup of raw asparagus gets you to about 18 percent of your recommended daily allowance. 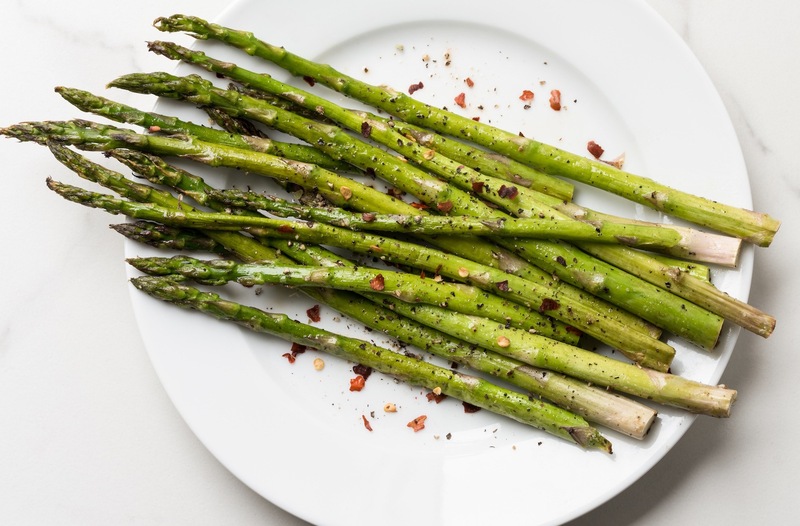 “Asparagus increases urine production, bringing water and waste out of the body,” says Lisa Hayim, RD, nutritionist and founder of The Well Necessities. Basically, the natural diuretic can help cut back on uncomfortable bloating. More antioxidants are always a good idea—antioxidants protect the body against free radicals, which helps with heart health and fights against diseases like cancer. Luckily, asparagus is rich in them—particularly glutathione. “Glutathione is an important antioxidant that plays a pivotal role in the detox process,” says Hayim. It’s also linked with healthier skin and better liver function. Struggling with constipation? It happens to the best of us. In addition to loading up on magnesium citrate, sipping on coffee and staying hydrated, try sautéing some asparagus and see if it get the job done. “Asparagus is rich in fiber,” says Hayim (about 3 grams per cup), “which makes it great for digestion and regular bowel movements,” says Hayim. Hey, whatever works! Is there such a thing as too much asparagus? What’s the best way to eat asparagus? As for Hayim, she’s all about blanching her asparagus. “This preserves the nutrients yet keeps it crunchy,” she says. Basically, put some washed and trimmed asparagus in a pot of boiling water for about a minute, then remove them and transfer to an ice bath to stop the cooking. You’re probably craving asparagus by now, right? Good, because you’re about to reap a ton of health benefits. And if you prepare it in the ways suggested by Hayim and Feller (can someone pass the balsamic vinegar, please? ), it’ll taste great, too. Happy sautéing! Looking for other ways to eat asparagus? Try this debloating soup recipe. Or this fresh asparagus and mint salad.